Description	 MS in Eastern Arctic Inuktitut on paper, Baker Lake, Nunavut Territory, Canada, 1978, 1 f., 58x76 cm, (12x25 cm), 9 long lines + 43 short lines in Inuktitut syllabic script, autograph, signed, inside pencil drawing. Provenance	 1. 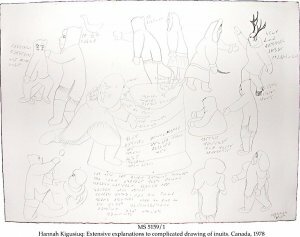 Hannah Kigusiuq, Baker Lake, Nunavut Territory, Canada (1978); 2. Sanavik Cooperative, Baker Lake, Nunavut Territory, Canada; 3. Gallerie aux Multiples collections, Québec. Commentary	 In 1876 Edmund James Peck adapted a system of syllabic writing, that earlier had been invented by James Evans for the Cree Indians, into Inuktitut language. The syllabary has 15 basic signs for the vocals i, u, a, the consonants and 2 diphthongs. Those are turned 90 or 180 degrees to represent the various syllables, in all 45 different sign positions. 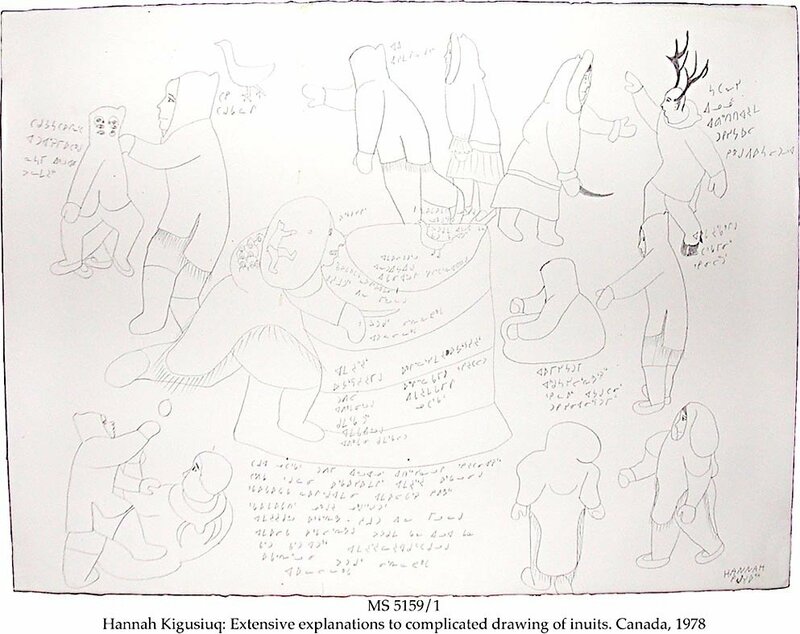 Hannah Kigusiuq (also spelt: Keegoaseat, Keegooseot, Keyousikuk), born 1931, Best known for her carefully controlled graphic pencil line drawings like the present one, in which she situates large numbers of people and animals in complex relationships with one another, frequently adding inuktitut syllabic notations to clarify her intent , or to present conversations among individuals. (Marion E. Jackson: North American women Artists of the 20th century. A biographical dictionary, 1955.) From 1970 to 1996 she participated in 44 exhibitions. She is represented in 18 public art galleries, museums and university collections.